The Spanish flag once flew over Texas. 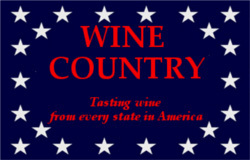 So have the flags of five other entities, but none of the grapes claimed by those other flags have taken to the Texas terroir like Spain's Tempranillo. In Driftwood, Texas they make a Tempranillo that is worthy of a little flag waving. The Bayer Vineyard Tempranillo 2011 - the first Tempranillo effort from Duchman (DOOKman) Family Winery is a real family affair. The 100% Tempranillo grapes come from the Bayer Family Vineyard. Winemaker Dave Reilly takes a break from the Italian varieties for which Duchman has become known and crafts a Texas-sized gem from the Spanish grape. Only 682 cases were made, and the wine contains a very reasonable 13.5% alcohol. The Tempranillo grape is planted worldwide, of course - about 575,000 acres’ worth - and it is the world’s fourth most-planted variety, with some of the oldest Tempranillo vineyards located in Spain’s Ribera del Duero and Rioja regions. This dark Tempranillo smells just how one would imagine a meeting of Rioja and the Lone Star State would smell. Huge whiffs of blackberry and blueberry are laced with some good ol' Texas dust. Earth plays a big supporting role, with oak pulling up in third place. A little bit of vanilla, a little bit of clove and a lot of leather are in its aromatic saddlebag. The wine's earthiness comes through even bigger on the palate, where it rivals those dark berries. There is an abundance of spice, tobacco and a hint of mint as well. If the Duchman Tempranillo - paired with a smoked brisket or a nice steak hot off the grill - doesn't make you happy, you should start therapy and make this issue #1. Less carnivorous folks will love this wine with sautéed mushrooms or roasted potatoes.